CBRE|Rochester was our host. Over 60 members and their guests attended. We started out networking in the lobby area of the newly renovated building with delicious food and cocktails catered by Label 7, who is a new tenant in the building. 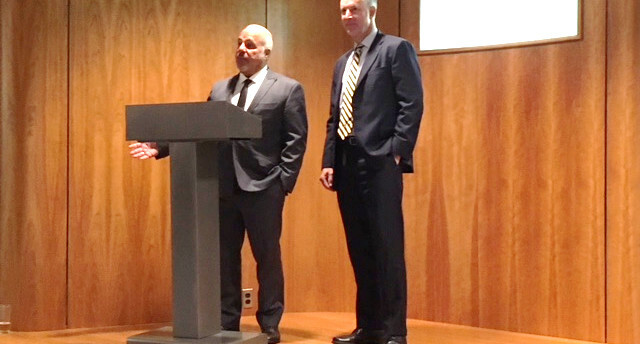 We then moved into the large board room off the lobby to hear our speakers, Peter Landers from Landers Management, who detailed the amenities of the building; Rob Sands, President and Chief Executive Officer of Constellation Brands; and Dan Burns, Regional President of M&T Bank. Tours were given of the 6th and 7th floors, where M&T Bank’s new offices are located. And, we were treated to several glorious views of downtown Rochester!